S. M. Walkington has loved books all her life. She wanted to write something that deals with the supernatural. 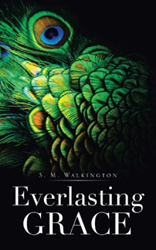 It prompted her to come up with “Everlasting Grace” (published by Balboa Press AU), a supernatural novel about a young woman who was unwillingly given immortality and dedicates her life to finding the sorcerer responsible for the spell. The book tells the story of Grace Heydon, a young woman cursed to immortality. Since she does not want to live a long, lonely life, she wants to track down the sorcerer who cursed her. Along the way, she befriends witches, a vampire and a werewolf who all want to help her reach her goal. "Feeling jealous of the body inside of the hearse was not a normal human emotion, but then again, it had been a while since Grace had felt like a normal human." S. M. Walkington lives with her husband and children in a small town in South Australia. She has a fascination with myths and legends.